To precisely control the speed of BLDC motors at high speed and with very good performance, an accurate motor model is required. As a result, the controller design can play an important role in the effectiveness of the system. The classic controllers such as PID are widely used in the BLDC motor controllers, but they are not appropriate due to non-linear model of the BLDC motor. To enhance the performance and speed of response, many studies were taken to improve the adjusting methods of PID controller gains by using fuzzy logic. Use of fuzzy logic considering approximately interpretation of the observations and determination of the approximate commands, provides a good platform for designing intelligent robust controller. Nowadays type-2 fuzzy logic is used because of more ability to model and reduce uncertainty effects in rule-based fuzzy systems. In this paper, an interval type-2 fuzzy logic-based proportional-integral-derivative controller (IT2FLPIDC) is proposed for speed control of brushless DC (BLDC) motor. The proposed controller performance is compared with the conventional PID and type-1 fuzzy logic-based PID controllers, respectively in MATLAB/Simulink environment. Simulation results show the superior IT2FLPIDC performance than two other ones. In this paper, the speed control of the BLDC motor is studied and simulated in MATLAB/Simulink. In order to overcome uncertainties and variant working condition, the adjustment of PID gains through fuzzy logic is proposed. In this study, three controller types are considered and compared: conventional PID, type-1 and type-2 fuzzy-based self-tuning PID controllers. The simulation results show that type-2 fuzzy PID controller has superior performance and response than two other ones. A. Sathyan, N. Milivojevic, Y. J. Lee, M. Krishnamurthy, and A. Emadi, “An FPGA-based novel digital PWM control scheme for BLDC motor drives,” IEEE Trans. Ind. Electron., vol. 56, no. 8, pp. 3040–3049,Aug. 2009. F. Rodriguez and A. Emadi, “A novel digital control technique for brushless DC motor drives,” IEEE Trans. Ind. Electron., vol. 54, no. 5, pp. 2365–2373, Oct. 2007. Y. Liu, Z. Q. Zhu, and D. HoweDirect Torque Control of Brushless DC Drives With Reduced Torque Ripple” IEEE Trans. Ind. Appl., vol. 41, no. 2, pp. 599-608, March/April 2005. 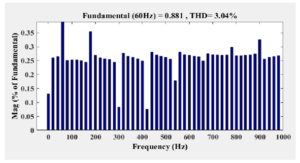 W. A. Salah, D. Ishak, K. J. Hammadi, “PWM Switching Strategy for Torque Ripple Minimization in BLDC Motor” FEI STU, Journal of Electrical Engineering, vol. 62, no. 3, 2011, 141–146. In this paper, a high performance brushless DC (BLDC) motor drive based on a fuzzy dynamic observer (FDO) is investigated. The FDO acts on the motor current and its gains are corrected by estimating current, rotor position and speed by fuzzy logic control (FLC). FLC is correcting gain’s FDO via real time. A PI speed control was chosen due to its low processing time and fast control. In order to reduce the model complexity, the back-EMF is assumed as being trapezoidal in a simplified machine model. The presented drive has been simulated by the MATLAB/SIMULINK software on the high speed BLDC motor model. Simulation results show that the proposed drive is able to estimate the rotor position and speed with high precision when high speeds are considered. Simulation results also show the reliability, fast computation and excellent dynamic performance with using fuzzy logic for high speed BLDC motor. Fig. 1. Block diagram of speed control of a three-phase BLDC motor. Fig. 2. Speed of rotor (N=30,000 rpm). Fig. 3. Back EMF three-phases (N=30,000 rpm). Fig. 4. Total torque (N=30,000 rpm). Fig. 5. Speed and estimated speed with FDO (N=30,000 rpm). Fig. 6. Rotor position and estimated position with FDO (N=30,000 rpm). Fig. 7. Speed estimated error with FDO (N=5,000 rpm, N=10,000 rpm and N=30,000 rpm). In this study, a fuzzy dynamic observer (FDO) scheme for a high speed BLDC motor drive is investigated. FDO micro gains are regulation by using fuzzy logic control (FLC) via real time. This approach has been simulated on a high speed BLDC motor nonlinear model. The FDO acts on the phase currents and also the micro gains will be quickly regulated real time according to error values by FLC. Also, the use of PI speed control accelerates the calculations of the rotor position estimation and speed. In this study, simulation results show that FDO are suitable for high speed BLDC motors and torque ripple is one of the indirect factors affecting the errors estimation. Nevertheless, these results show that the FDO is suitable for high speeds. In addition, as torque ripple is one of the main estimation error this parameter can be decrease by the torque ripple optimization. Lei Hao, H. A. Toliat, “BLDC Motor Full-Speed Operating Using hybrid Sliding Mode Observer “Applied Power Electronics Conference and Exposition, APEC ’03. Eighteenth Annual IEEE, vol. 1, pp. 286 – 293, February 2003. S. M. M. Mirtalaei, J. S. Moghani, K. Malekian, B. Abdi, “A Novel Sensorless Control Strategy for BLDC Motor Drives Using a Fuzzy Logic-based Neural Network Observer “International Symposium on Power Electronics, Electrical Drives, Automation and Motion, SPEEDAM 2008. IEEE, vol. 1, pp. 1491 – 1496, July 2008. Li Qiang, W. Ruixia, “Study on Rotor Position Detection Error in Sensorless BLDC Motor Drives “5th International Conference Power Electronics and Motion Control, IPEMC 2006. IEEE, vol. 3, pp. 1-5, August 2006. J. Lee, S. Sathiakumar, Y. Shrivastava, “A novel speed and position estimation of the brushless DC motor at low speed “Power Engineering Conference, AUPEC 2008. IEEE, vol. 3, pp. 1-6, December 2008. M. Divandari. R. Brazamini, A. Dadpour, M. Jazaeri, “A Novel Dynamic Observer and Torque Ripple Minimization via Fuzzy Logic for SRM Drives “International Symposium on Industrial Electronics, ISIE 2009. IEEE, vol. 1, pp. 847 – 852, July 2009. This paper presents an intelligent control architecture for a sensor based brushless DC motor. A BLDC motor is superior to a brushed DC motor, as it replaces the mechanical commutation unit with an electronic one; hence improving the dynamic characteristics, efficiency and reducing the noise level marginally. Conventionally a PI-controller is used for speed control purpose in many industrial BLDC motor drives. But the accuracy level obtained by the PI-controlled drive is insufficient for advanced sophisticated applications. So as a better choice, a fuzzy logic control technique is applied to this motor to achieve a greater accuracy in controlling the speed. Fig. 1. Block diagram for speed control of BLDCM using PI controller. Fig. 2. Block diagram of a fuzzy logic controlled BLDC motor drive. In this paper we discussed the BLDC motor speed control using a fuzzy logic controller. A detailed analysis was done on fuzzification, fuzzy rules and defuzzification methods and lookup table was obtained by using fuzzy algorithm. The PI control scheme and fuzzy based PI scheme were simulated using MATLAB and compared. The dynamic response of speed in using FLC was better than only PI scheme. These results show that a PI based FLC technique is a better choice for BLDC motor drive and favors to widen its area of application in near future. Paul C. Krause, “Analysis of electric machinary”, McGraw-Hill, 1984. P.S. Bimbhra, “ Generalized Theory of Electrical Machines”, Khanna Publishers. P. Yedamale, Brushless DC (BLDC) Motor Fundamentals. Application Note 885, Microchip Technology Inc., Chandler, AZ,2003. Efficiency improvement of motor drives is important not only from the viewpoints of energy loss and hence cost saving, but also from the perspective of environmental pollution. Several efficiency optimization methods for induction motor (IM) drives have been introduced nowadays by researchers. Distinctively, artificial intelligence (AI)-based techniques, in particular Fuzzy Logic (FL) one, have been emerged as a powerful complement to conventional methods. Design objectives that are mathematically hard to express can be incorporated into a Fuzzy Logic Controller (FLC) using simple linguistic terms. The merit of FLC relies on its ability to express the amount of ambiguity in human reasoning. When the mathematical model of a process does not exist or exists with uncertainties, FLC has proven to be one of the best alternatives to move with unknown process. Even when the process model is well-known, there may still be parameter variation issues and power electronic systems, which are known to be often approximately defined. The purpose of this paper is to demonstrate that a great efficiency improvement of motor drive can be achieved and hence a significant amount of energy can be saved by adjusting the flux level according to the applied load of an induction motor by using an on-line fuzzy logic optimization controller based on a vector control scheme. An extensive simulation results highlight and confirm the efficiency improvement with the proposed algorithm. D. Divan and H. Johal, “Distributed facts-A new concept for realizing grid power flow control,” in IEEE 36th Power Electron. Spec. Conf. (PESC), 2005, pp. 8–14. L.Gyugyi, C.D. 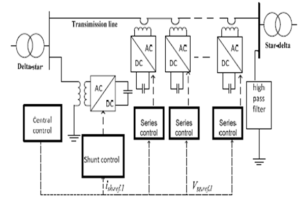 Schauder, S. L.Williams, T. R. Rietman, D. R. Torgerson, and A. Edris, “The unified power flow controller: A new approach to power transmission control”, IEEE Trans. Power Del., vol. 10, no. 2, pp. 1085– 1097, Apr. 1995. 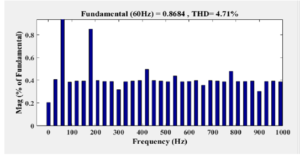 M. Mohaddes, A. M. Gole, and S. Elez, “Steady state frequency response of statcom”, IEEE Trans. Power Del., vol. 16, no. 1, pp. 18–23, Jan. 2001.